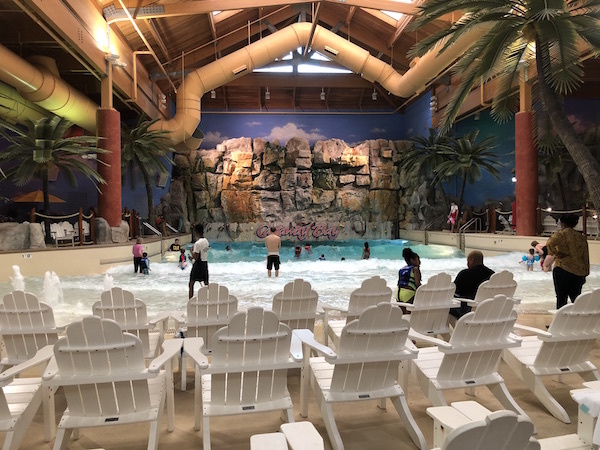 No matter what the weather outside, it’s 82 degrees and tropical at Castaway Bay, a super fun indoor water park in Sandusky, Ohio! 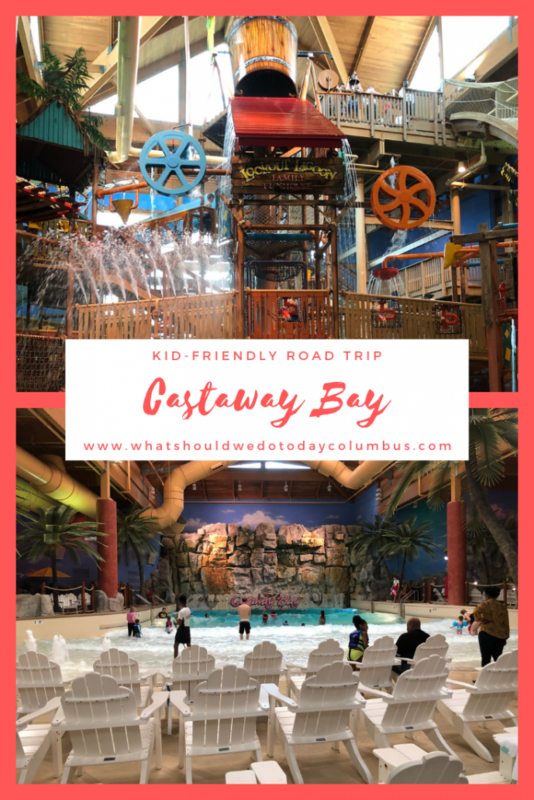 Thanks to Castaway Bay for sponsoring this post! Ohio Winters seem to drag on even when the calendar says it’s officially “Spring”. The end of March is when this dragging on gets particularly hard! 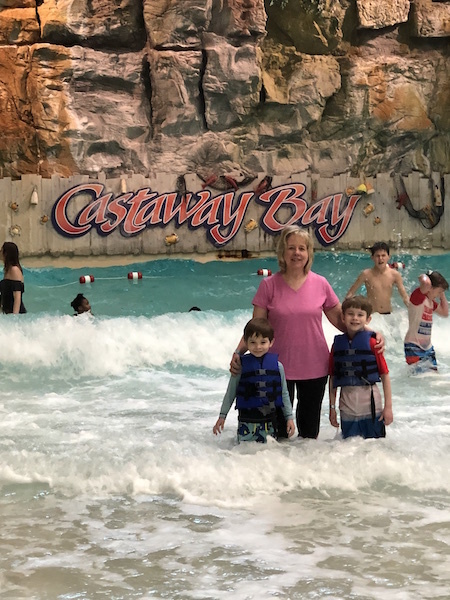 Luckily we had scheduled an overnight trip to Castaway Bay in Sandusky to help cure us of our winter blues! As it turned out, when our trip rolled around, my husband was too sick to go so my mom accompanied us on this trip. 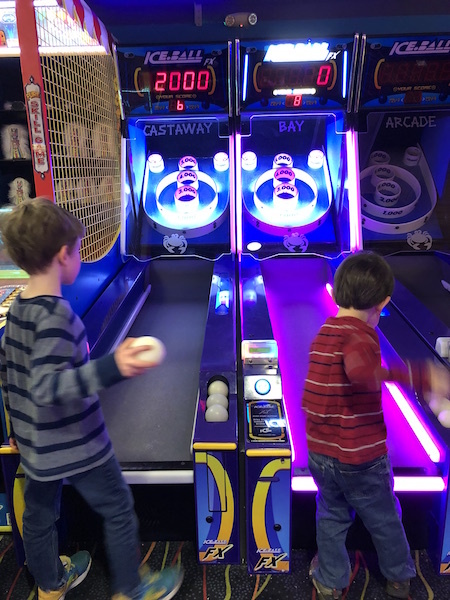 This turned out to be a total bonus because my kids are way better behaved for Grandma than they are for me! The real draw for this whole water park experience is that it’s all inclusive! With the hotel, restaurants and other activities provided, you never need to leave the property! 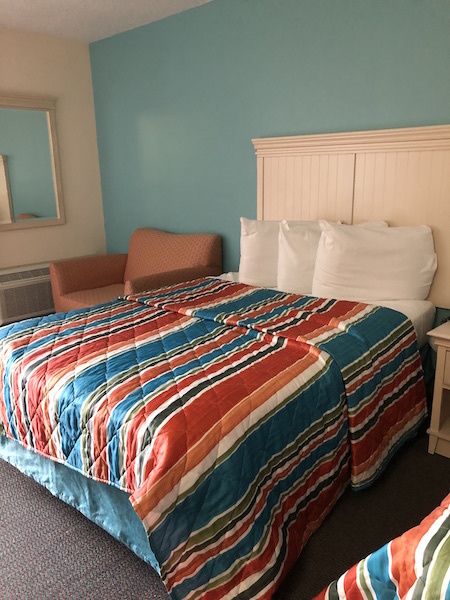 The rooms also include a microwave and refrigerator, adding the convenience of coming back to the room for snacks or to eat leftovers! Most of the rooms also offer a balcony or private deck. I was a little bit nervous that the hotel would be loud at night but I ended up getting a surprisingly good night’s sleep! 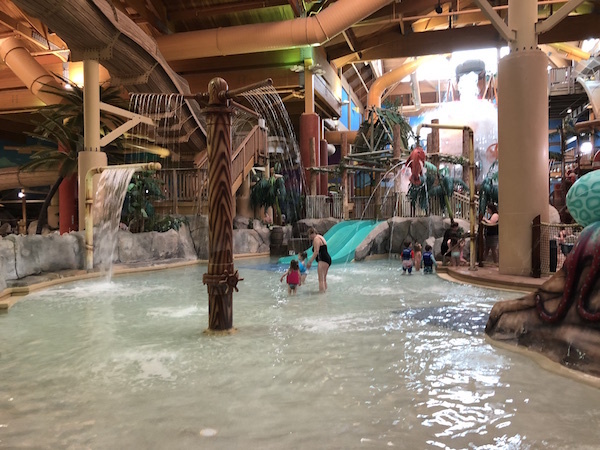 My mom and I basically let the kids dictate our time in the water park and they spent most of it running from the wave pool to the toddler pool! When the waves took a break we would head for the toddler pool, and when Jaden heard the buzzer announcing the waves were about to start back up, we would head back over to the wave pool! I was happy to see my kids get more comfortable in the water! Castaway Bay offers life jackets for whoever wants to use them and my kids wore them the whole time. 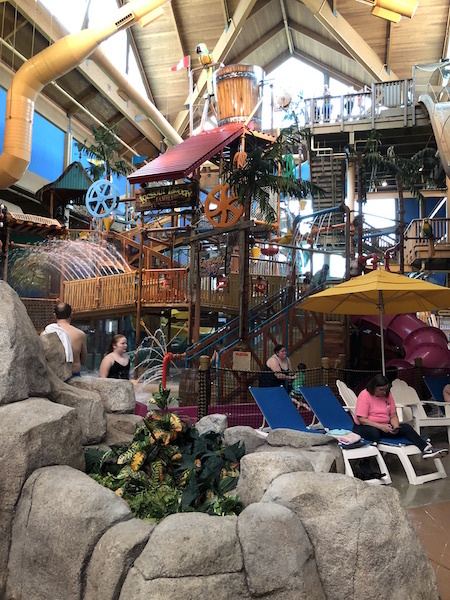 Within the Caribbean themed water park are several different areas for kids, teens and adults to play in! Check this list of attractions for the various height, weight and life jacket requirements. Towels are provided for you within the park. 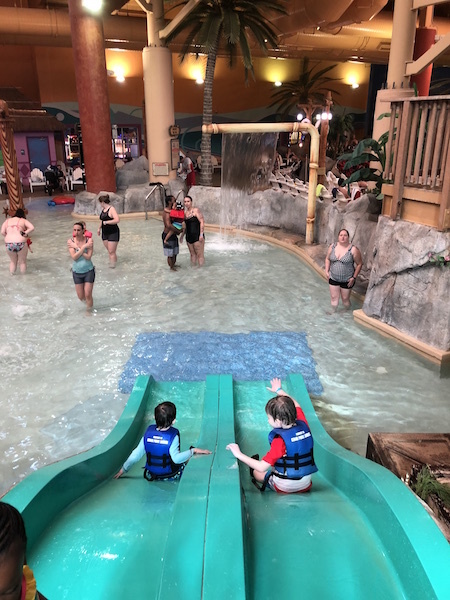 Kids under 48 inches and under must wear a life vest in the Castaway Bay Wave Pool and kids 42 inches and under must be accompanied by a “supervising companion” – which means someone who is 14 years old or over. 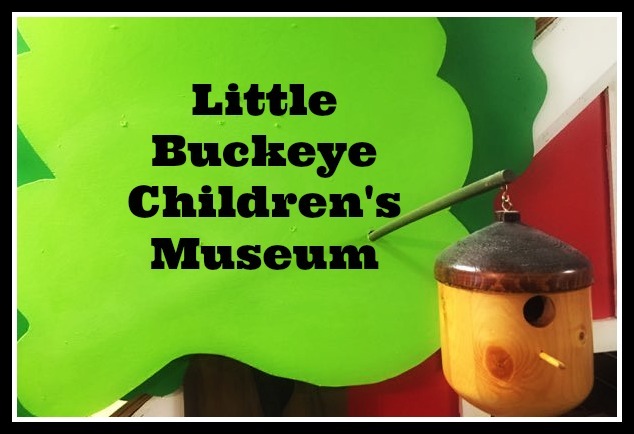 This area is 18 inches deep and perfect for the little ones! There are two slide areas, fountains and a gradual entry. Kids must be under 52 inches to play here. Take the challenge at Cargo Crossings – can you get across the water without falling? These are enclosed body tube slides! Kids must be 46 inches tall to ride the Tropical Tube Slides. 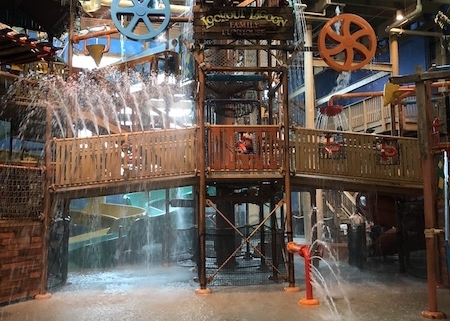 Rendezvous Run is a water coaster featuring a boat that two people can ride in. You must be able to walk up the steps of the tower to ride. 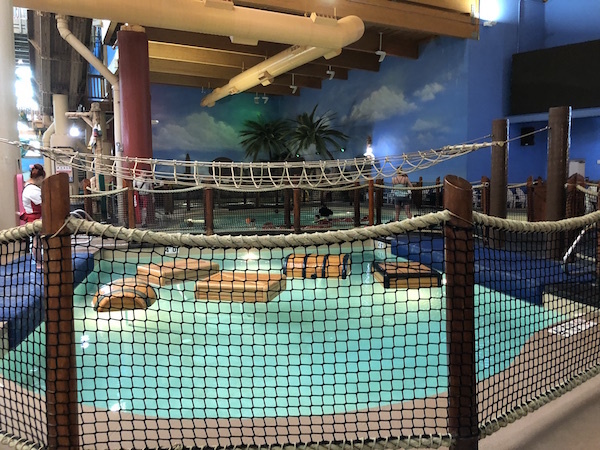 The Lookout Lagoon is a play area for all ages. 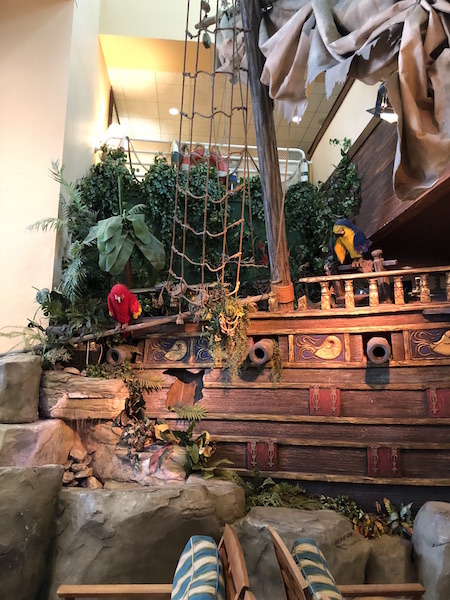 Water is no deeper than six inches and the play structure includes sprayers, net crawls, rope bridges and more! 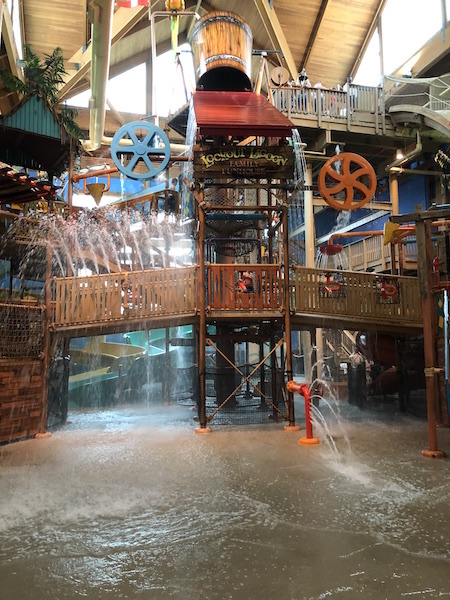 There is a huge pail that spills when it gets full for a humongous splash! 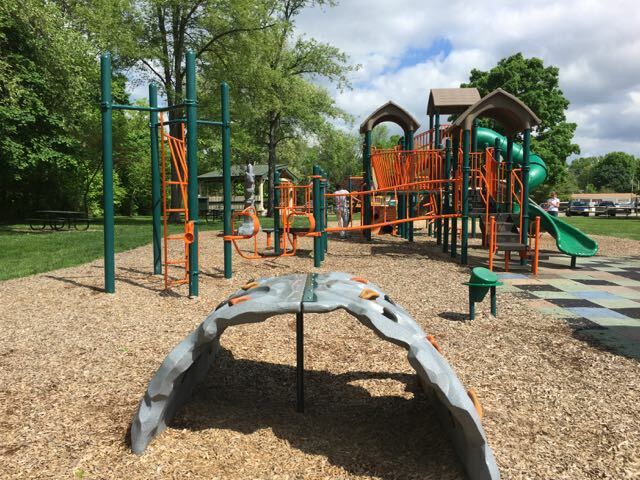 The area also has 4 body slides with height requirements ranging from 36 inches to 40 inches. 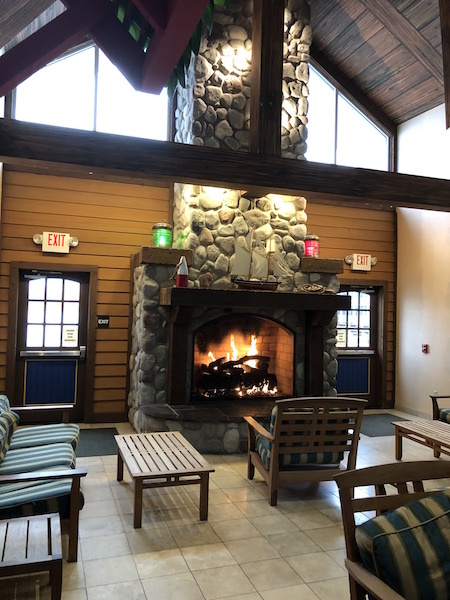 MY favorite area was The Grotto – the hot tub area that opens up to the outside! The weather outside was in the 40’s so the breeze from outside was the perfect accompaniment to the hot water! The water is 3 feet deep so my kids were also able to be in the area comfortably. 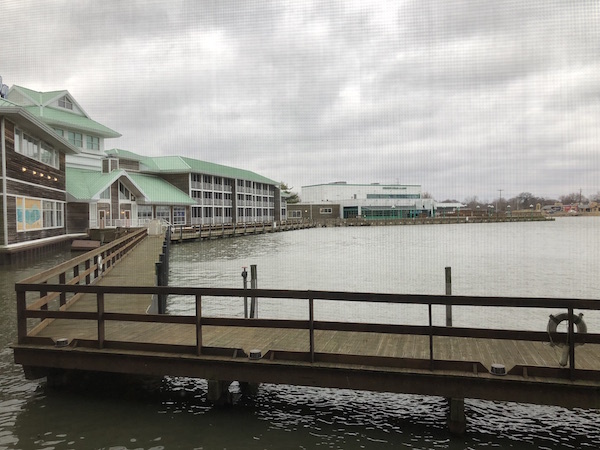 One great thing about staying at Castaway Bay is that there are several restaurant options to choose from so that you never have to leave the hotel! We had dinner at Quaker Steak & Lube the evening we arrived. The menu is huge so there is definitely something for everyone and there is a decent kids’ menu as well. 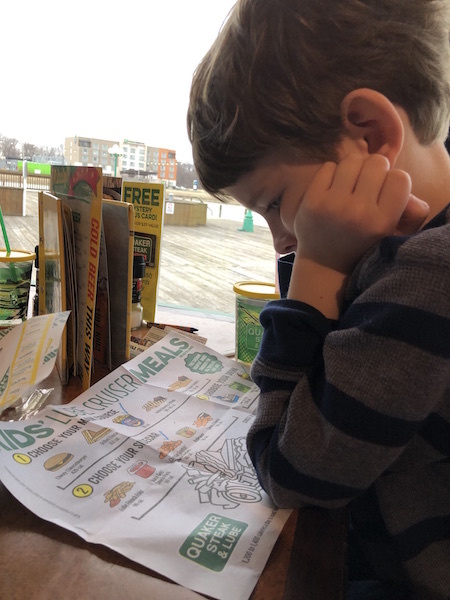 It was our first visit to a Quaker Steak & Lube and My kids were big fans of the car and vehicle oriented decor! For breakfast, Mango Mikes offers an all you can eat buffet. The price was $12.95 for adults and $6.95 for kids. It’s a great option for families but since my kids eat like birds, we opted to save a little money and get a smaller breakfast at Ebb & Eddy’s Sweets & Eats. You can purchase packages that include the breakfast buffet – definitely something to look into! Ebb & Eddy’s serves smaller options for breakfast like yogurt, bagels, fresh fruit, donuts, baked goods and Starbucks coffee drinks. Toft’s Ice Cream is also served here as well! Ebb & Eddy’s is also open into the evening for your snacking convenience! 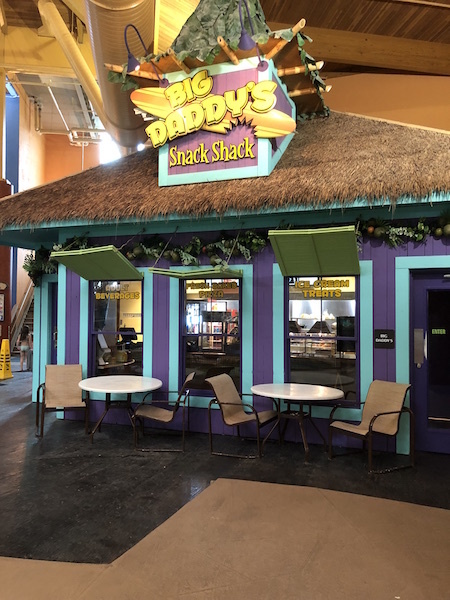 Big Daddy’s Snack Shack is accessible from INSIDE the water park serving pizza, ice cream, adult beverages and other snacks. 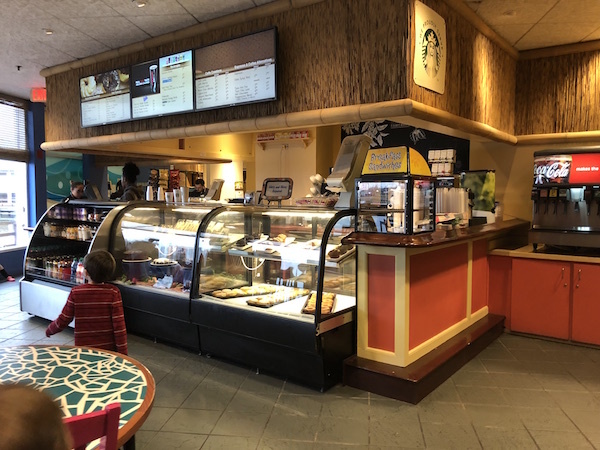 You are allowed to have food purchased inside Castaway Bay in the water park area! 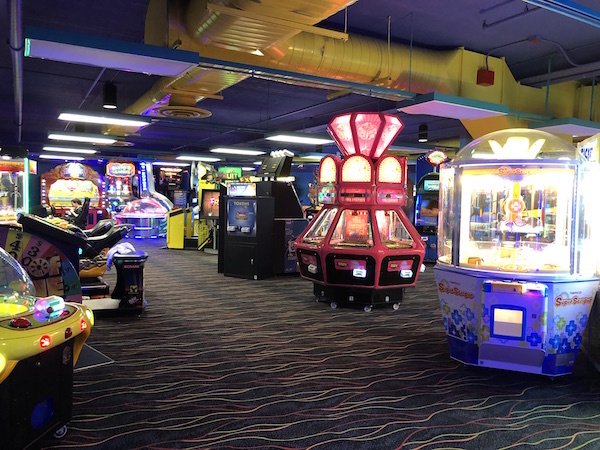 The Crabbie’s Quarter Deck Arcade is a fairly large arcade! Play cards are available at the machine just inside the door and can be reloaded at a discount. There are also packages available. 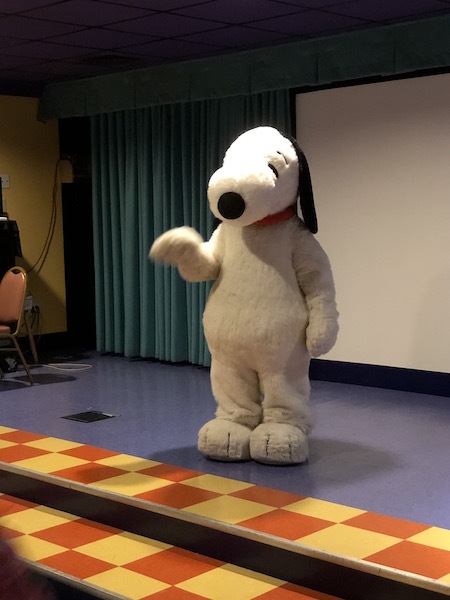 In the evenings, kids can gather at Club Castaway on the third floor for a 30 minute Peanuts movie, a story time and visits from Peanut’s characters. 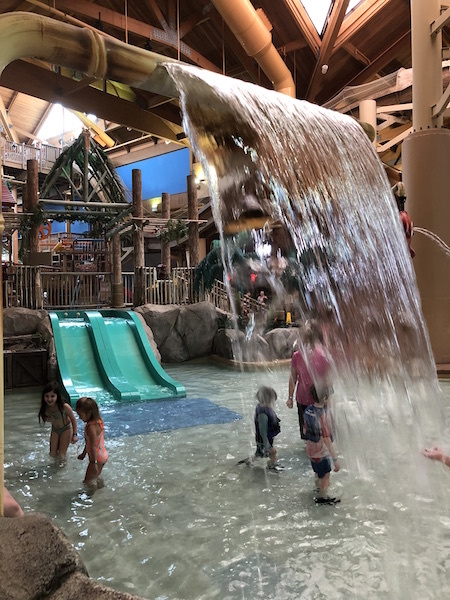 During select hours, Club Castaway also offers crafts and activities that kids can do if you need a break from the water park! 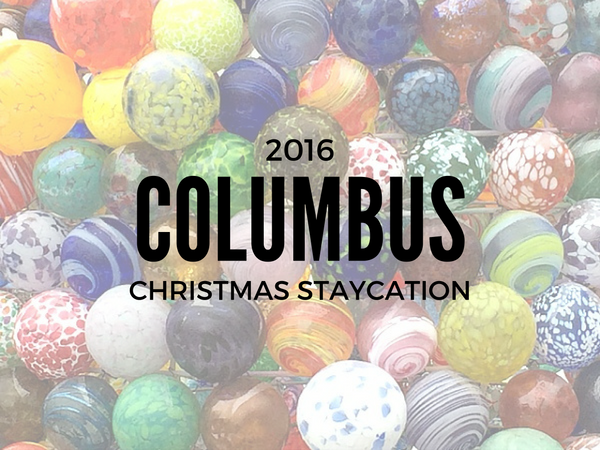 There are some crafts that are an additional cost and some free coloring activities. There are also toys available to play with!  Make sure to check out the Special Offers page for package deals that include meals and other entertainment! 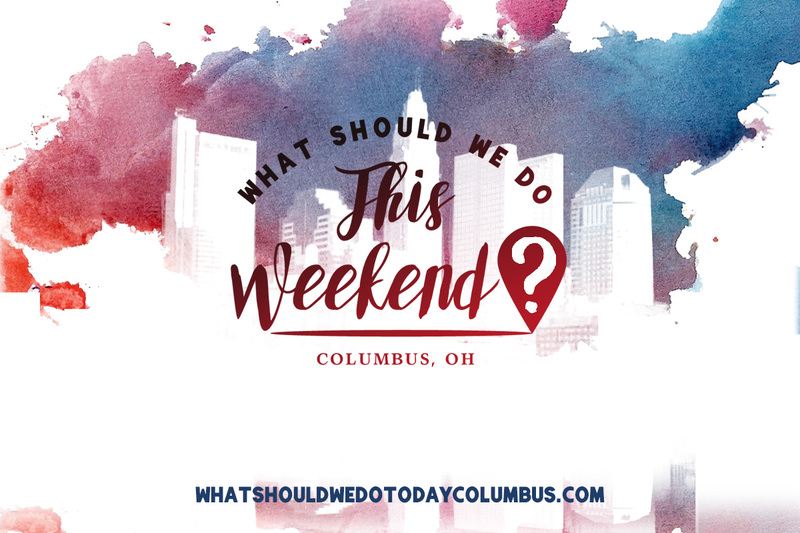 Day passes are also available for $29/ticket. 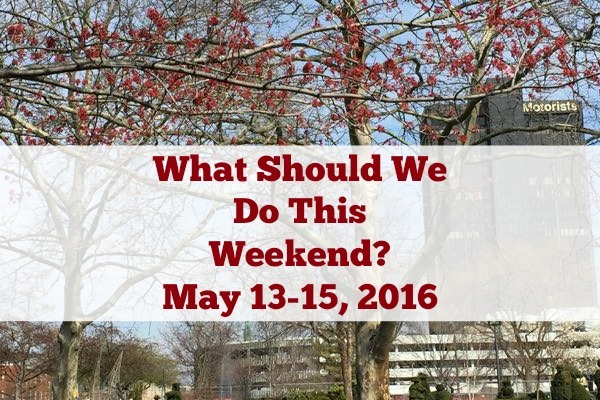 Check the website for group ticket rats and discounts for Cedar Fair Platinum Passholders. 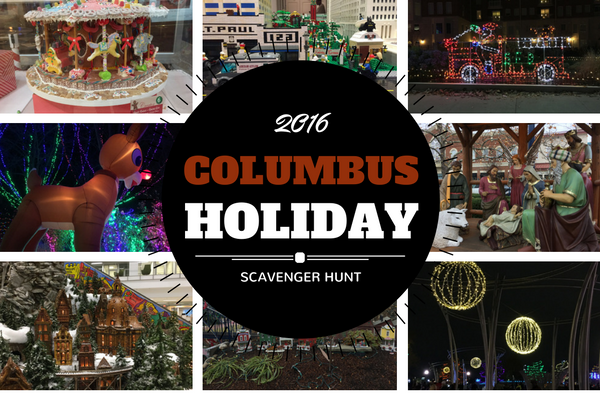 2016 Columbus Holiday Scavenger Hunt: 25 Things to Find Before New Year's Day!